For the Undeclared episode, see Undeclared. The Perfect Date is a 2019 American comedy film, directed by Chris Nelson, from a screenplay by Steve Bloom and Randall Green. It stars Noah Centineo, Laura Marano, Camila Mendes, Odiseas Gerorgiadis and Matt Walsh. It was released on April 12, 2019, by Netflix. The film is based on the novel The Stand-In by Steve Bloom, published by Carolrohda Lab in October 2017. 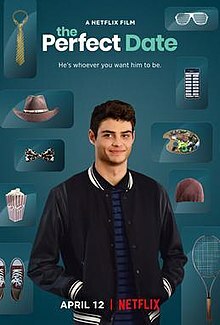 Brooks Rattigan (Noah Centineo) is a high school senior, with dreams of getting into Yale, while his father (Matt Walsh) wants him to go to the University of Connecticut, where Brooks has a full ride. He works at a sub shop with his best friend, programmer Murph (Odiseas Goergiadis), but financing his college dreams proves troubling. Brooks seizes the opportunity to make some extra cash by posing as the boyfriend of the self-assured, combat boot-loving Celia Lieberman (Laura Marano) and find he has a knack with his adaptable personality. He meets Shelby (Camila Mendes), who is under the impression that Brooks is wealthy. He makes it his goal to win her over. He and Murph launch an app, selling himself as the plus-one for all occasions. After finding out that Celia has a crush on Franklin Volley (Blaine Kern II), they set up a plan to fake break-up, in which each of them gets to be with Shelby and Frank. As business booms for Brooks, Murph feels neglected and cuts Brooks off, and switches his shift at the sub shop. Celia sets up an interview for Brooks at Yale, and is upset when she finds out that he researched the dean previously and lied about being an amateur beekeeper. Brooks justifies it, saying that it's no different than what he's been doing with his app. Celia realizes that Frank is not the person for her, however doesn't tell Brooks. When they conduct their fake break up, she is hurt by his words, and slaps him. Brooks is under the impression that it's all an act. Following their "break-up," Shelby asks Brooks to accompany her to her school formal. Brooks realizes that Shelby is far more privileged and blind to his life than he had initially expected. The two find it difficult to relate to one another and struggle to hold a conversation. At the formal, Brooks sees Leah, a girl who had used his app to "practice dating." She reveals all about Brooks' app to Shelby, who is offended and disgusted by the theme of Brooks' app. He reveals to Shelby that he's not from the wealthy town that she believes he's from, and that he needs the money to go to Yale. She calls him a liar and leaves. Brooks approaches Celia, who's also at the dance. She declines his offer to dance, and says that she's not going to be his backup now that Shelby's not interested. He returns home and talks to his dad about what's been going on in his life. His dad is surprised and says he didn't know that Yale meant that much to Brooks. Brooks also says that his app wasn't only to raise money, but to try to figure who he was and what his plan is. His dad reminds him that nobody truly knows who they are, and admits to Brooks that he is proud of who his son is becoming. Brooks decides to accept UConn's offer, because if he has to pretend to be somebody else to go to Yale, he doesn't want to go. Brooks apologizes to and makes up with Murph. He also meets up with Celia and writes a letter to her, where he reflects on how his previous ambitions were to drive the fanciest car, go to the nicest school, and date the nicest girl. But he's revealed that these ambitions made him a bad friend, an ungrateful son, and self-obsessed. He writes that the times when he felt the most himself was when he was with Celia and wants to be with her. Meanwhile, Brooks informs his dad that he has received mail - which turns out to be a grant designed to help him reignite his failing writing career. It his heavily implied that this letter is actually a fake, and written by Brooks himself. using his "Yale-fund" earnings from the app to give his dad the push he so desperately needs. Celia visits Brooks at home and apologises for slapping him. The two then go to the sub sandwich restaurant which has been retrofitted for a party, with Murph and Tuna Melt in attendance. Murph reveals his admission to UConn and Brooks reconciles with Celia, sharing a kiss. The four then continue to dance until the end of the film. In March 2018, it was announced Noah Centineo, Camila Mendes, Laura Marano, Matt Walsh and Odiseas Georgiadis joined the cast of the film, titled The Stand-In, with Chris Nelson directing from a screenplay by Steve Bloom and Randall Green. In January 2019, it was reported that Netflix had acquired worldwide distribution rights to the film, retitled The Perfect Date. Principal photography began in March 2018, in New Orleans. It was released on April 12, 2019. On review aggregator website Rotten Tomatoes, the film holds an approval rating of 71% based on 7 reviews, and an average rating of 6/10. ^ N'Duka, Amanda (March 27, 2018). "Camila Mendes, Laura Marano, Noah Centineo & Matt Walsh Star In 'The Stand-In' From Awesomeness Films". Deadline Hollywood. Retrieved October 2, 2018. ^ Galuppo, Mia (March 27, 2018). "'Riverdale' Actress Camila Mendes, Matt Walsh to Star in 'The Stand-In'". The Hollywood Reporter. Retrieved October 2, 2018. ^ "Netflix Acquires Noah Centineo, Laura Marano and Camila Mendes Starrer 'The Perfect Date' From Awesomeness Films and Ace Entertainent". Netflix Media Center. Retrieved 26 March 2019. ^ "Riverdale Star Camila Mendes Lands Role in The Stand-In Along with Noah Centineo, Laura Marano and Matt Walsh". The Tracking Board. March 27, 2018. Retrieved October 2, 2018. ^ "Do you want to go on The Perfect Date". Twitter.com. March 7, 2019. Retrieved March 7, 2019. ^ "The Perfect Date (2019)". Rotten Tomatoes. Retrieved April 12, 2019. This page was last edited on 16 April 2019, at 23:09 (UTC).